The Virginia State Water Control Board must deny 401 certification for the Atlantic Coast Pipeline (ACP). It should have denied 401 certification for the Mountain Valley Pipeline (MVP). Building these fracked gas pipelines through steep, rough terrain and karst geology is fraught with danger. Construction is already causing massive soil erosion that pollutes our streams, rivers, wetlands, and eventually the Chesapeake Bay. Dr. Ralph Northam said on the campaign trail to become Governor of Virginia, referring to the MVP being built by a corporation called EQT and the ACP being built by Dominion. Both are 42-inch diameter fracked gas pipelines planned to be built through West Virginia, Virginia, and North Carolina. Governor Northam, it’s not being done right, and without the right steps forward from your administration, Virginia’s water resources and everyone in the path of these projects will remain at risk. He also said he sent a letter to the Virginia Department of Environmental Quality (DEQ) requesting a stream by stream assessment of pipeline crossings instead of relying on a U.S. Army Corps of Engineers blanket permit. Listen to his words in this video. This is a campaign promise that has not been delivered. We hear from Dominion, EQT, and the DEQ’s Director, David Paylor that these pipelines have been through the “most rigorous environmental review process in history.” If this is true then we have a flawed system. Various permits have been revoked by the courts. There are more lawsuits than I can count. Landslides, soil-covered roads, yards, and driveways, and repeated Notices of Violations are almost everyday occurrences. The Virginia DEQ has shut down the MVP because the state’s Erosion and Sediment Control standards are not adequate to handle the siltation from a project of this magnitude. I hear from the opposite side that these pipelines are safe. I’m not convinced. 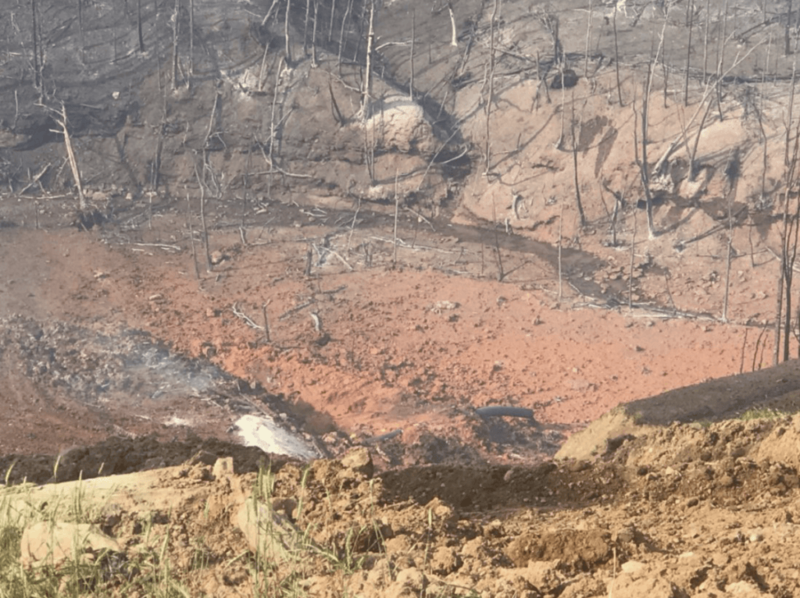 There was an explosion of a newly constructed 32-inch pipeline just months ago in Moundsville, West Virginia that incinerated 11 acres of land. The Pittsburg Post-Gazette reported on the explosion on June 7, 2018. It was determined that the explosion was caused by a mudslide. Drone photo published in the Intelligencer Wheeling News-Register on June 11 near Moundsville, WVA after the explosion. 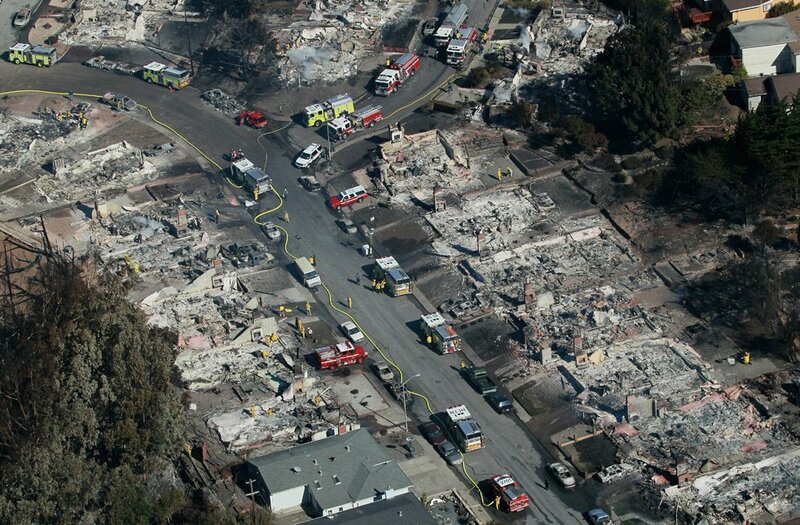 In 2010 the San Bruno natural gas pipeline destroyed 37 homes and killed eight people. In 2008 a natural gas pipeline explosion in Appomattox destroyed two homes. There were 297 significant incidents from pipeline accidents in 2017 according to the U.S. Department of Transportation’s Pipeline and Hazardous Materials Safety Administration. They define “significant” incident as any fatality or damage exceeding $50,000. There were eight fatalities and damages exceeding $200 million in 2017. Just because EQT and Dominion keep saying pipelines are safe does not make me believe it. I’ve taken their other talking point, that having a pipeline under or near your property will not lower its value, with a grain of salt as well. I see the news reports. I see the pictures of soil erosion. We hear the voices of the people affected and run over by theses profiteering corporations. 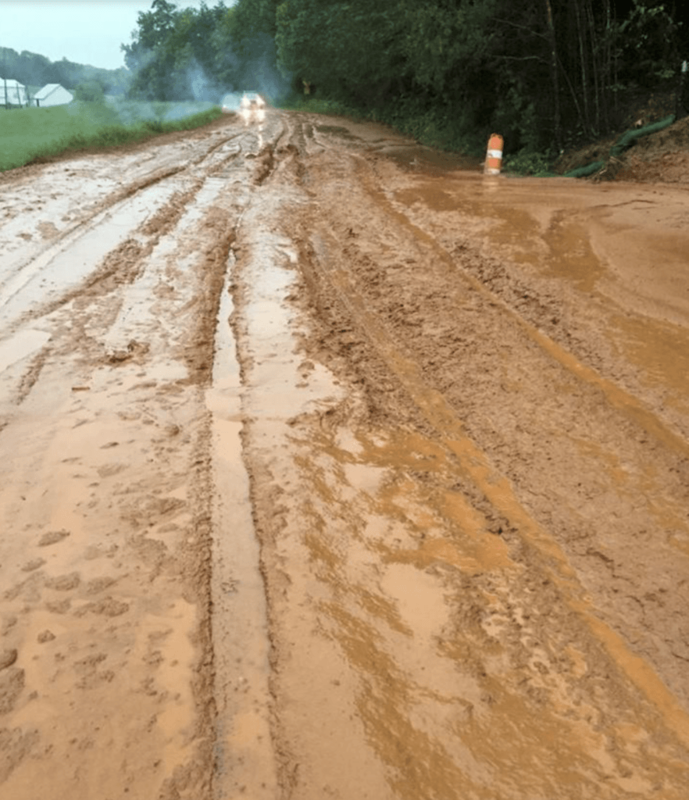 VDOT closed Cahas Mountain Road on May 20 in Franklin County because of mudslides caused by construction of the MVP. Cahas Mountain Road covered with sediment from the construction of the Mountain Valley Pipeline. Photo from 3WV and WINA. The Chesapeake Bay Foundation, Southern Environmental Law Center, Appalachian Voices, Chesapeake Climate Action Network, Potomac Riverkeeper, and many other organizations concerned about sediment pollution in our streams filed a lawsuit in the U.S. Court of Appeals, Fourth Circuit Court on April 17, 2018 to appeal the Virginia SWCB’s decision to issue conditional 401 certification for the ACP. “The Atlantic Coast Pipeline has the potential to damage Virginia waterways from the Allegheny Mountains to the Chesapeake Bay, so its construction and operation must be held to the strictest environmental standards possible. We have always maintained that the Water Control Board cannot have reasonable assurance that water quality will be protected unless it evaluates the adequacy of the pipeline company’s plans to prevent construction-caused erosion, dirty stormwater, and other impacts,” stated Jon Mueller, CBF Vice President for Litigation in a January 22 press release. Both planned pipelines are going to blast and trench through karst terrain. That is a type of active geology that causes sinkholes, solution channels, and caves. The ACP is planned to go through the widest and most active karst area in Virginia – Augusta County. This is not only dangerous for the pipeline and the gas it will carry but it will affect how groundwater behaves and most likely affect people’s drinking water. MVP contractors were not supposed to cut trees after the beginning of the nesting season for migratory birds, yet they kept felling the trees, bird nests and all. The ACP has conditional 401 certification from the Virginia State Water Control Board because they did not submit all the plans required by law and yet they proceeded to cut down trees along the path of the pipeline. They did not follow the Federal Energy Regulatory Commission’s instructions while cutting the trees. They were served a “Notice of Violation” because they cut trees too close to streams. If Dominion can’t follow directions to cut a tree down, how can we trust them to follow directions with the largest fracked gas pipeline in Virginia and the largest soil disturbance since the interstate highways were built? The Truth Is We Can’t Trust Them. The sedimentation onto adjacent landscapes and into our streams during construction of these pipelines has been and will be, a constant quagmire of pollution and injustice. If these projects move forward, there will be unprecedented damage to our environment and a litany of lawsuits. Below are my suggestions on how Governor Northam can “do it right” and avoid these very avoidable consequences. First, he should halt all construction for the MVP and the ACP until a proper review has been completed by FERC as requested by Senator Tim Kaine and members of Congress from both parties. There are many studies that show that these pipelines are not needed. Second, the administration should require the stream-by-stream, detailed construction plans for every stream and wetland crossing as promised. If Virginia’s State Water Control Board cannot conclude that these plans will ensure that state water quality standards will not be violated then it must deny 401 certification. Dominion has a long history of disregard for the law. Dominion and EQT have multiple “Notices of Violations” from Virginia and West Virginia. Based on Dominion’s track record for environmental stewardship I don’t believe for a moment that these pipelines can be built without violating our water quality standards and our rights. Governor Northam, you and you alone can make this right. It’s time for your administration and its agencies to put the citizens of this Commonwealth – our health and safety – above the corporate interests putting us, and our environment, at risk. You are absolutely correct, Dominion Energy is only interested in their profit margin. They do not care for the safety of citizens at all! Who wouldn’t jump on a deal like that? Thank you, George! I should have put your points in the post. So, thanks for doing it for me. Robert, are you tied into one or more of the networks fighting this? The VOICES coalition, BXE, Appalachian Gas Working Group, whichever VA organizations are close to you? I am very engaged in this—I live in western WV, where we are also battling the drilling and fracking that feeds it all, and a planned monstrosity of a petrochemical complex to line the Ohio River from Pittsburgh to Huntington. And where we have politicians who even pretend to be on our side. I’ve said it’s a David and Goliath battle if Goliath is the usual ten foot giant but David is not a little Jewish boy—he’s a rabbit, without a slingshot or even opposable thumbs. But the industry has a PR campaign going that suggests they think we have opposable thumbs. So we’re glad these pipelines go through Virginia—because our allies there have a chance. It’s not only because there are cities and liberals in much greater concentration there, it’s also because it has a diverse economy—here people have gotten used to the idea that if we want jobs with decent paychecks we must sacrifice the environment and our health for them. Mary, thank you so much for reaching out to us. We are all in this together. We can and do make a difference. Another thing. Besides that sweet, sweet deal FERC gives pipeline companies, where they get to make their ratepayers cover all their costs plus 14 % profit–I wonder, if they have to pay fines or lawsuit damages, do they get to call those costs part of the project and make a 14 or 15% profit on them, too? I’ve never seen an answer to that question. Anyway, here’s another piece: the drillers and frackers here are steadily losing money. The modern techniques for getting gas out of deep shale they love to brag about are EXPENSIVE as well as dangerous to the environment and local people’s health, and the wells deplete much faster than shallower ones did. See David Hughes’ Shale Gas Reality Check–he’s a Canadian geologist who’s been studying oil and gas in North America for decades, and this analysis includes well by well data. He says they’re exaggerating how much they can get out of these plays (to keep the loans flowing), which means these pipelines likely will be empty in a decade or two, never paying for themselves–but why should Dominion or EQT care? They get their payoff before the bust. Anyway, that wasn’t even my point, which is that since they have a glut of too-cheap gas here, their hopes for getting out of the red center on two things: pipelines to run the gas elsewhere–no, not to you, they’re LYING, US demand is flat. The pipelines are to take the gas to export facilities, of which 22 are on the drawing board. No guarantee they can sell it profitably in Europe or Asia, given the extra costs of compressing and shipping, and competition from gas from Russia and the Middle East–but their HOPES for profit far away justify seizing Americans’ land and putting a dangerous pipeline in it. The other hope is a planned megacomplex of storage and petrochemical facilities to pollute the Ohio River from Pittsburgh to Huntington–a second Cancer Alley. Thank you for articulating the current problems we are facing with these intrusive and potentially dangerous pipelines, Bobby. All concerned citizens, not just those in the pipeline paths, should write/call Gov.Northem and the water conservation board, to join you and others in expressing our concerns and a call to halt construction until the developers meet safe standards or pay huge, punishing fines. And FERC needs to admit that the pipelines are not needed for US energy security but for export to other countries. Period! The doctor is IN: New quotes indicative of Governor Northam’s position on unneeded, fracked-gas pipelines in today’s Bluefield Daily Telegraph. Years ago, while working in Ecuador’s Amazon Basin called El Oriente our team (mostly American) entered a shabby village called Shell Mera in the eastern foothills of the Andes out of which emerged the country’s longest “anaconda,” a crude oil pipeline that twisted its dark way across the Sierra through the spectacular Papallacta Pass and then toward the coast through terrain prone to earthquakes. In some places, the environmental devastation has been severe with catastrophic oil pollution. Despite industrial promises to the contrary, how could any technological feat withstand the region’s potent geological forces? Similarly, in the Shenandoah Valley, citizens have challenged a proposed $5 billion natural gas pipeline that might snake its way through several States to threaten private and public lands, ancient forests, conservation easements, vulnerable communities, and endangered species. The pipeline –our own Anaconda – threatens to strangle the livelihood of residents up and down the Atlantic Coast. It will have an undoubted irreversible impact on the region’s rich biological, agricultural, and cultural heritage. All this to add 600 miles to the Nation’s extensive pipeline network of more than two million miles. Yet the fossil fuel industry vacuously argues that the pipeline is critical infrastructure and it will honor all applicable environmental regulations (“Liar, liar, pants on fire!”). Given that the entire Valley lives on karst topography, a fragile limestone feature that protects and provides freshwater to homes, businesses, farms, communities, and natural resources, then such proposals seem the outcome of lunacy. Even the Commonwealth’s Department of Mines cautions against the construction of gas pipelines in karst. Why does the fossil fuel industry repeatedly ignore the planet and then inflate its engineering skills and technologies as superhuman? One word comes to mind: PROFIT. Such projects plainly expose the broken link between our animal nature and our sense of place. It is only a matter of time before we witness an explosive breach in the proposed 42-inch-wide pipeline, the contamination of groundwater, silt-laden streams, and the loss of natural springs. The backdoor shenanigans of their planners, developers and investors expose the desperation of a dinosaur industry. Bruce! Thank you so much for the story of the anaconda and for your brilliant prose. Bravo! I am proud of your stance, your research, and your voice. Keep fighting for clean water. Thanks, Bobby. I’m especially glad you spoke up on this issue. Your explanation of how groundwater could be impacted by the construction is especially valuable, as that has been repeatedly questioned. You give the details needed. Yes, we need a flood of protests to Gov. Northam. H’burg and the Forest Service are both battling erosion of soil, gravel and roads due to the heavy downpours we got in July especially. I defy anyone to say there will be no damage to streams. It’s already happening as you have visually shown. So far as I can see, none of the state agencies responsible for the debacle are up to the job. Clearly, there are people who expect to make a lot of money from this. We have to keep fighting for the soil, water, air, critters and people who are impacted by this monstrosity. Anne, you speak so true. Thank you for your continued support and fight for our natural resources. Indeed, it’s all about the money. There do not seem to be consequences for destroying Central Appalachia. What do citations for making this mess mean? What do they do? Apparently, nothing. Since the entities responsible are breaking the law, why haven’t criminal charges been brought against them? This catastrophe is happening in too many places in our country. I hope this insanity is stopped before the next explosion. Thank you, Sheila. I feel it too. With respect to just one watershed in the ACP’s path – Middle River in Augusta County – an incident like what happened in Franklin County could reverse the improvement made in the River’s water quality over the last 20 years. Imagine what the rains we have had in Augusta County since April would collectively do to multiple watershed crossings. Multiply that potential devastation by the dozens of watersheds in the ACP’s path, and we’ll have a catastrophe on our hands. My guess is that Dominion would deny that it did anything wrong, and likely it will be up to us, the local population, to fix it. All of that, just so Dominion can make more money. It is imperative that DEQ and Gov. Northam realize that any permit must take into account the worst case scenario and that the Corps of Engineers’ blanket permit does not do that. Spot on, Joe. Thank you. Kathi, thank you, so much. No one said anything about the typo. I fixed it, thank you.